Buy One Get One Free Zoom Whitening and Other Great Holiday Gifts! Every year, we have a few great recommendations to keep your loved ones smiling at the holidays. There are a few new contenders this year, so we wanted to give you a comparison between our favorites and our not-so-favorites. Sonicare. Electric toothbrushes make a great holiday gift. Especially for the gadget head in your family, we highly recommend the Sonicare. (https://www.lakebaldwindental.com/blog/2016-12-06-sonicare-really-great) These toothbrushes are clinically proven time and again to be the most effective, and I see that claim supported in my patients. Across the board, my Sonicare users have less plaque and healthier gums. 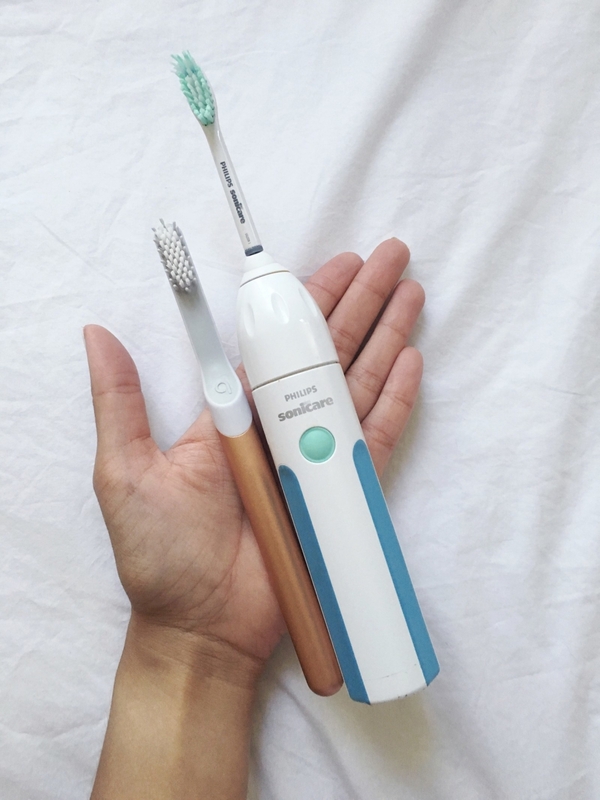 Their brushes now come with Bluetooth to track brushing habits, where you need to pay better attention, where you might be brushing too hard, and when you need to change your brush head. For kids, their Bluetooth enabled Sonicare links to a game on your phone or tablet to keep kids engaged in their oral care, and it also tells on them if they haven’t been doing a great job. For adults, we recommend the Diamond Clean for a gorgeous look and functionality, and the FlexCare Platinum for a more cost effective option. Quip. There are a variety of mail-order subscription toothbrushes that have been popping up lately, with ads in Instagram and Facebook. While it’s certainly an advantage to have those replacement heads sent to you every three months, the Quip brush has a few major flaws. Number one, it is not rechargeable. Unlike a Sonicare, you have to use batteries and they need frequent replacement. This not only creates unnecessary waste, but it makes the brush more expensive in the long run. These brushes also have little clinical research behind them, and lack the power of a Sonicare. However, any toothbrush you will use consistently and properly will remove plaque. I have a few patients who are using this brush and it seems to be doing okay for them so far. For now, we will wait and see how they perform long term, but we’re still team Sonicare for the time being. WaterPik. This thing is amazing for those little retainers behind the lower front teeth, for bridges, crowns, hard to reach spots, and especially braces. 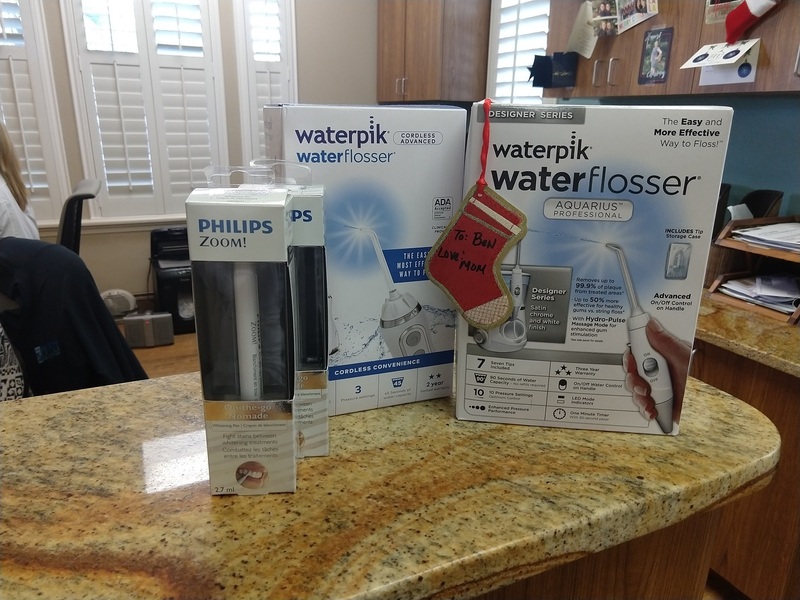 (https://www.lakebaldwindental.com/blog/2016-10-04-waterpik-not-bad-i-thought) For anyone in your life who hates flossing, this thing is a game changer. It is way more comfortable and you don’t have to stick your hands in your mouth. This gift is also wonderful for individuals with limited dexterity, who may not be able to floss due to issues like arthritis or Parkinson’s. And I know I said braces earlier, but I cannot stress this one enough. Anyone with braces needs a WaterPik. It is really the best way to keep your braces clean and healthy. There is also now a travel model which can be used in the shower to minimize mess! AirFlosser. This is actually a Philips product (the same people who make Sonicare), but they missed the mark on this one. There are a few similar “flossing” gadgets I’ve seen, but none of them so far stands up to the WaterPik in terms of efficacy. The AirFlosser just shoots food out from in between the teeth, but doesn’t reach under the gums in the same way or help to really flush out attached bacteria. Better than nothing, but not the best. Whitening Services. The gift of a white smile is truly generous. We have multiple options available in the office with professional products and amazing results. (https://www.lakebaldwindental.com/blog/2017-10-10-could-your-pearly-whites-be-little-whiter) Best of all, if you purchase a gift certificate for in-office Zoom whitening, you’ll get one for yourself, too! That’s right, buy one, get one for Zoom whitening this holiday season. At home whitening. While White Strips certainly work, any at home whitening product has its limits. Even the ones with the little blue light just are not the same as what your dentist can do. Generally, you won’t get as profound a shade difference, and at home products can be difficult to do right. Also, it is important to have your dental health professional evaluate your teeth before you whiten to make sure they are healthy, free of cavities, and that you don’t have any restorations like fillings or crowns on your front teeth. These will not whiten, and if you use an at home product, you could make those restorations really stand out in a bad way. We hope all of our patients have amazing holidays and a great new year. If you have any questions about dental gifts, let us know! Best part, we have many of our products already gift wrapped and ready to set under the tree! 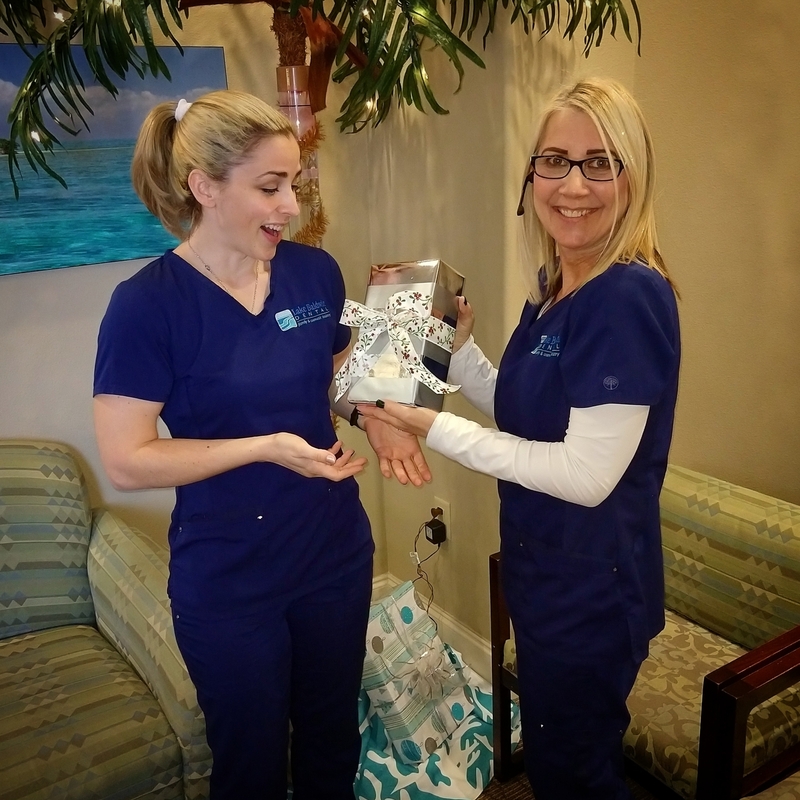 Grab one next time you’re in the office and give the gift of a great smile, Orlando!